Click to view the Earth wall chart. The Global Education Project is a Canadian non-governmental organization with a 15-year history of publishing fact-packed educational wall posters and producing live events to educate about important issues. The Global Education Project's previous poster on the Middle East is being used by over 200 colleges and universities in Canada, US, and internationally, as well as thousands of individuals and activist organizations. The information takes a bold look at a wide range of environmental issues-from climate change and species extinctions to debt, population, and food supply-giving a rare visual overview of the state of ecological and humanitarian conditions over the entire biosphere. Designed to provide solidly irrefutable factual information on issues that are widely talked about but less frequently understood, the poster uses data from the United Nations, official government agencies, academic sources, and well-respected NGOs. 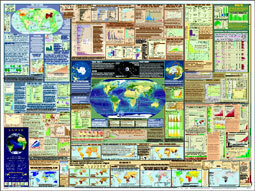 As well as being an invaluable teaching tool and reference piece, the poster, through the source citations that accompany each map and chart, is an index to over 150 sources of environmental and humanitarian data, most of which are available on the web, making it even more useful to activists, educators, and researchers. NEW - Take the Earth Quiz! A perfect starting point for catalyzing discussion about the state of the world; compact, comprehensive and meticulously referenced. Each component on Earth is rigorously footnoted to a reliable and authoritative source. A summation of the core data of the most crucial issues facing all humanity; succinct, accurate and concise. Earth: A Multimedia Presentation on the State of the Planet. Email earthevents@theglobal educationproject.org or call 250-935-6785 for details. INDEX | CONTACT | ABOUT THIS PROJECT | DISCLAIMER | Copyright 2004 IDEA Inc.